In 2009, Bogaerts' Aruba South team participated in the Senior League World Series, squaring off against U.S. competition in Bangor, Maine. In 2009, after drafting Xander, the Red Sox also landed Xander's twin brother, C/1B Jair, for $180,000. Jair was the first one to impress Boston cross-checker Mike Lord. But as he was wrapping up his visit, he asked one final question to those around the workout. Was there anyone else on the island, he wondered, who he should see before heading back to the States? Yes. 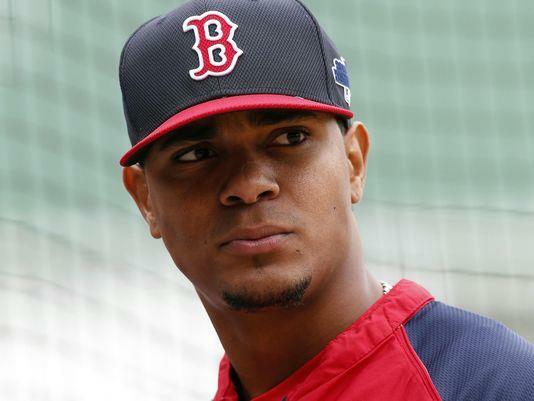 Xander Bogaerts, the twin brother of Jair, was consigned to his bed while completing his recovery from chicken pox. But everyone Lord talked to at the workout said the same thing: This was the guy to see. The scout met Bogaerts’ uncle, Glenroy Brown, the man who had given the twins their grounding in baseball. A call was made, and after some initial reluctance, Bogaerts’ mother, Sandra, relented. Bogaerts could go to the workout. In 2011, the Baseball America Prospect Handbook rated Bogaerts as the 14th-best prospect in the Red Sox organization. They moved him up to #2 in the spring of 2012. And he was at #1 prospect in Boston's farm system in the offseasons before both 2013 and 2014 spring trainings. Xander has a solid work ethic. He plays with a lot of energy and enthusiasm. He is mature both on and off the field, and displays impressive baseball intelligence and the drive to succeed. Bogaerts is compared the most to Hanley Ramirez, and that just happens to be Xander's favorite player. Another favorite when growing up: Andruw Jones, who is from Curacao—another Caribbean island that is a constituent country to the Netherlands, just as Aruba is. In 2013, Bogaerts played for the Netherlands in the World Baseball Classic. Bogaerts has had to play through his minor league career under a lot of scrutiny and expectations from Red Sox nation. And he has, for the most part, been able to filter everything out but baseball. "I didn't want to have no expectations. I just always try to go out there and have fun, play the right way," he said. "Once you put expectations on yourself, it might start to go downhill and you put more pressure on yourself. There are a lot of fans at the games, you hear your name a lot, but you try to block all of it out and keep focusing on the baseball. "It's what I've done all my life. Growing up, enjoying every moment of it. That's the best way you can play and that's when I'm at my best." Jonny Gomes talked about Bogaerts call-up to the team on September 1, 2013. "This time of year is fun too, seeing guys get called up like Xander Bogaerts. Most people look at tools when it comes to a player, you know, speed, power, etc. I look at it if you’re in the big leagues, you’re good. So we can put the tools aside. I need to know what kind of person you are, if you have the will to win, the will to learn, to be a good teammate. "Xander is out taking ground balls at 3:40 for a 7:00 game," says Gomes. "That says something about his work ethic and also he asks questions and wants answers. He’s really plugged in. He’s off to a good start. He’s way ahead of the curve with how young he is." Xander is intelligent and multilingual. This native of Aruba didn’t begin his pro career until after he’d earned his high school diploma at age 16. In 2011, Xander played for the Dutch national team in the Baseball World Cup, winning the gold medal. Bogaerts wears the #2 jersey to honor Derek Jeter. April 18, 2014: Bogaerts expressed remorse for accidentally tweeting a picture of a woman who wasn't fully dressed, and he noted it was a learning experience. "It definitely wasn't my intention," said Bogaerts. "Once I found out it was on Twitter, I went and deleted it and also locked my Twitter account." December 2016: Bogaerts committed to play for the Netherlands in the 2017 World Baseball Classic. April 7-11, 2017: Xander was on the bereavement list. April 1, 2019: Red Sox president of baseball operations Dave Dombrowski has been in the game for 40 years, and there’s very little that surprises him at this point in his career. But the fact he was able to secure a six-year, $120 million contract extension with shortstop Xander Bogaerts less than two weeks after reaching a five-year, $145 million extension with ace Chris Sale qualified as the joyfully unexpected. Once Sale signed, Dombrowski didn’t think the club would be able to extend itself enough to get Bogaerts signed before free agency started in November. As it turns out, Bogaerts was motivated enough to stay with the Red Sox that a deal was able to be consummated. Make no mistake about it: the driving force in the extension for Bogaerts was, well, Bogaerts. Once it was loud and clear to agent Scott Boras what his client wanted to do, Boras needed a few things from the Red Sox, and they complied. The first was an opt-out clause, which Bogaerts can exercise if he chooses at the end of the 2022 season. The second is a vesting option for 2026 that kicks in if Bogaerts has 535 plate appearances in ’25. If the deal reaches the maximum length, it will be worth $152 million over eight years, including the $12 million that Bogaerts will earn this season from the one-year contract he signed in January. “It was really a very cooperative effort driven by Xander’s desire to really remain with this team,” Boras said. “I said, ‘Look, if you guys can work on the opt-out thing, I think I can help you’. This is one of those rare instances you have a guy where you kind of have an ability to forecast what his evaluations are. For shortstops to hit 20 home runs is pretty rare. Will he be a 30-home-run guy? “Basically, I wanted a scenario where he had eight [years] at $152 million. That’s his choice. Or at 29, he can hit the free-agent market knowing, ‘I have an [average annual value] of $20 [million] and I’ve made right around $100 million in my career.’ When you’re that young, you get those choices. Not many players do." Red Sox assistant general manager Brian O’Halloran and Boras were the key negotiators in the deal, and much of it got done on Opening Day, when the Red Sox were playing the Mariners in Seattle. After winning a World Series in his first year as manager, Alex Cora now sees an even brighter future with Bogaerts and Sale along for the foreseeable future. Still to be determined is whether Mookie Betts will sign a long-term deal with the Red Sox. The American League’s reigning Most Valuable Player Award winner is eligible for free agency after the 2020 season. But it was a day to celebrate Bogaerts, who originally signed with the Red Sox as an international free agent out of Aruba at the age of 16. Many of Bogaerts' teammates packed the small interview room at the Oakland Coliseum to attend the press conference prior to the Red Sox-A's game. 2009: Bogaerts signed with Red Sox scout Mike Lord, out of Aruba, for a bonus of $410,000. The team promised Xander's mother that he could finish high school before reporting to the Dominican Summer League team in 2010. Jan 13, 2017: Bogaerts and the Red Sox avoided arbitration, agreeing to a one-year deal worth $4.5 million. Jan 12, 2018: Xander and the Red Sox avoided arbitration, agreeing to a one-year deal for $7.05 million. Jan 11, 2019: Xander and the Red Sox avoided arbitration, agreeing to a one-year deal for $12 million. March 31, 2019: The Red Sox and shortstop Bogaerts finalized a six-year contract extension, a deal that will keep him in Boston through at least 2025. The agreement is for $120 million, according to sources. Including the $12 million Bogaerts is making this season, he will earn $132 million over the next seven years. There is a vesting option for 2026, the club said in its announcement. Bogaerts has a sound approach at the plate. He has an easy swing with strong hands that provide increasing power to all fields. When he impacts the ball, it makes that special sound. Xander will hit for average and power. Xander does a good job of keeping his weight back and driving balls to the opposite field. He has power to all fields. And he is a mature hitter. Baseball folks are very impressed with the way he adjusts between at-bats. "He knows what he's doing wrong and the very next AB, he's going to go out there and correct it," Red Sox minor league hitting instructor Luis Lopez said in August 2011. "This kid has an idea. He won't give away at-bats." He consistently hits for power, especially vs. breaking pitches from righthanders. Bogaerts uses a smooth swing to generate startling power. Xander is able to correct mistakes from one at-bat to the next and to recognize how pitchers tried to attack him. He handles breaking balls well and drives the ball to all fields, exhibiting well above-average power. Bogaerts shows terrific aptitude at the plate and a great work ethic. “I like to train; I don’t like to sit down and be lazy.” He has athleticism and a beyond-his-years willingness to drive the ball with power to all fields, all while maintaining a textbook fluid swing. He has improved his pitch recognition and his ability to implement the Red Sox's preferred approach of selective aggression at the plate. He is becoming more selective. In fact, he's very selective at the plate, working pitchers deep into counts and accepting a base on balls. He endeavors to work pitchers for more walks. And in 2013, he walked an impressive 13.5 percent of his plate appearances. Xander is a confident, strong hitter who doesn't muscle up to tap into his excellent power. When he gets a pitch in his part of the strike zone, he punishes it. He can hit anywhere in the lineup. During 2013 spring training, Baseball America rated Bogaerts with a 60 for his overall hitting ability, and a fine 70 for his power, on the 20-80 scouting scale. In 2013, Bogaerts showed tremendous aptitude while confronted with advanced upper-level pitching, at one point reaching base in 30 straight games while showing both patience and power at the plate. When the Red Sox called Xander up to join the A.L. East pennant race in August 2013, he became the third-youngest player in the Majors—behind only the Rangers’ Jurickson Profar and the Nationals’ Bryce Harper. October 2013: Xander became the third youngest player to triple in a World Series. The other two were Mickey Mantle and Ty Cobb. Aug 1, 2015: All season long in 2015, the hits have kept coming for Red Sox shortstop Xander Bogaerts , and they're coming in situations usually reserved for proven veterans. A major difference-maker for Bogaerts this season has been a more aggressive approach at the plate. His swing rate has increased from last year by five percent, according to Fangraphs, and his contact rate on pitches thrown outside of the strike zone has jumped along with it—from 62.2 percent in 2014 to 69.9 percent in 2015, as of August 1, 2015. Bogaerts is striking out less and hitting more ground balls that, with his ability to scatter the ball to all fields, have resulted in a drastically higher number of singles. As Xander continues to gain experience and further distance himself from the struggles of 2014, his ability to overcome the tough games that inevitably crop up over a long season has grown stronger, as well. It came down to one final dramatic sequence with two outs in the bottom of the ninth, but Xander had his 26-game hitting streak snapped in a 5-2 loss to the Blue Jays. Representing the tying run, Bogaerts struck out swinging on a full-count, 99-mph fastball by Blue Jays closer Roberto Osuna to end the game. Bogaerts went 0-for-3 and walked twice. He was ahead in the count, 3-0, in his final at-bat in the ninth before Osuna bounced back. In hindsight, Bogaerts wished he would have laid off the pitch, which would have been high for a ball, to get David Ortiz to the plate with the bases loaded. March 31, 2018: Bogaerts, who homered, doubled and finished 3-for-4 during a 3-2 win against the Rays, is the first player in Red Sox history to have multiple extra-base hits in the first three games of the season. In fact, according to the Elias Sports Bureau, the only MLB player to pull off that feat in the last 100 years is Dodgers first baseman Adrian Gonzalez, who did it in 2015. As of the start of the 2019 season, Bogaerts had a career batting average of .284 with 176 doubles, 74 home runs, (832 hits), and 386 RBI in 2,931 at-bats. Xander displays a strong arm at shortstop. He has very fluid actions and above average range. But he lacks true shortstop quickness. Bogaerts might grow out of shortstop, lacking the quick feet for the position, and could move to third base. But he is impressive moving around at short, displaying impressive athleticism and intelligence. His hands work well while reacting to bad hops. He has learned not to try to complete impossible plays. Bogaerts has a strong arm. Xander could probably play in the outfield. He is athletic and has good body control for his size. "You have to be impressed with how quickly his feet move and allow him to get to the right position,” Sox coach Brian Butterfield said. “You look at his athleticism, his body control, his ability to get the ball there in the air with arm strength. He has all the prerequisites." In the spring of 2013, Baseball America rated Bogaerts with a 60 arm and a 55 for his overall defense. In 2013, after playing the hot corner for the Netherlands in the World Baseball Classic, he adapted quickly to his crash course at third. Bogaerts made considerable defensive progress at both positions, to the point where he gives Boston the flexibility to let him play either position, depending on the team’s need. At 2015 Spring Training, Red Sox infield instructor Brian Butterfield said, "We've already done four team defenses where Bogaerts is a step ahead of where he was last year." "There's so much that goes into it," said Butterfield. "Shortstop is just a critical position and a guy that at such a young age and in a big-time market, that was quite a challenge for a kid. But he showed some toughness by fighting through ups and downs in 2014. He finished the season strongly, and I think that helped him coming into camp in 2015 and he knows that he worked real hard and we have a confident player going in." For a guru of fundamentals like Butterfield, there's nothing quite as sweet as seeing a player whose body and mind are working in harmony. Xander is a fringe-average runner, a 50 on the 20-80 scout's scale. It is the only place he has an average rating. Every other tool is way above average. He gets his share of stolen bases, 10-15 a season. August 23-30, 2014: Bogaerts was on the D.L. with a concussion. April 9-27, 2018: Xander was on the DL with small crack in talus bone in left ankle.